(Recall A simplified overview of HTML forms.) When the form is submitted over HTTP, all that is sent is a dictionary of key-value pairs. Each form element (text box, checkbox, select, etc.) generates at most one item for the dictionary, where the key is the name of the element (given by the name attribute) and the value is the string value of the element (“alice”, “pA55w0rd”, “on”, “viewer”, etc.). Perhaps surprisingly, the dictionary’s keys need not be unique. For example, if there are two text boxes named “foo”, one with the value “bar” and one with the value “baz”, then the submitted form data would be “foo=bar, foo=baz” (or possibly “foo=baz, foo=bar”). So for the form pictured above, the submitted information will be something along the lines of “username=roule, email=roulette@localhost, realname=Roulette, affiliation=Pani, password=01234567″… But wait! What about the membership table? The first (but incorrect) idea that comes to mind is to give the same name for all elements in a column. For example, all the project selects would be named “project”, and all the role selects would be named “role”. The problem with this is that in the presence of multiple “project” and “role” keys, we don’t know which one was assoicated with which. A concrete example: Suppose John is a viewer in Alpha and a developer in Beta. The submitted form data would look like “project=Alpha, project=Beta, role=viewer, role=developer”, but with the entries being presented to the server in an arbitrary order. So it would be impossible to associate projects and roles uniquely. Clearly then, the solution is to give each field a unique name. A simple method is to add a counter after the name – like “project0”, “project1”, “role0”, “role1”, etc. How would the server process this information when it’s submitted? Assume that the client does not send the count of the number of rows. One way for the server to handle the variable number of rows is to start from a prearranged fixed number – 0 in this example – and process form fields and count upwards until the first n such that the submitted field “projectn” does not exist. Keep the client-side behaviour and modify the server-side behaviour. For each new row, give an auto-incrementing numerical suffix for the form fields. Do nothing special when removing rows. 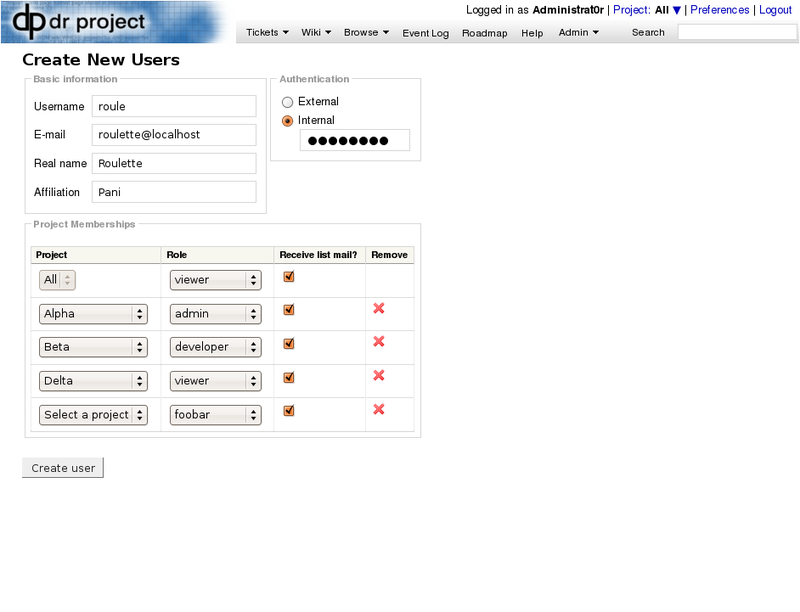 On the server, iterate through all form fields that have a name of the form “projectN“, where N is a number string. Ignore “gaps” in the numbering. Modify the client-side behaviour and keep the server-side behaviour. When a row is removed, re-enumerate the rows that follow it. This is the solution that I picked, for no particular strong reason. Now, if this problem were merely hypothetical, I wouldn’t have a good reason to write this rant-like-lengthed post about it. But it does already exist in DrProject! Namely, it manifests itself in the “Membership Preferences” section of the Edit User page and also on the current user’s Preferences page. This entry was posted on 2008-07-10-Thu at 10:58 and is filed under DrProject, Uncategorized. You can subscribe via RSS 2.0 feed to this post's comments. You can comment below, or link to this permanent URL from your own site.